Virtual reality can be a bridge to many experiences that may be out of reach for some. With VR, you can play board games with people halfway around the world, visit foreign countries, and more. With Percussive VR, the developer hopes to deliver a different kind of experience that connects to real life: Learning to play an instrument. This is no far-flung interest for Eisenhauer; the game is the result of his own experiences growing up. 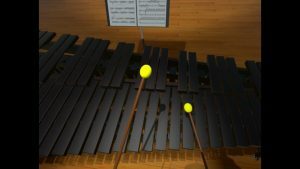 Percussive VR, in its current form, features the marimba, steel drums, and glockenspiel. You can practice or perform for friends and you have a choice of mallets that influence the different sounds you can create. It’s only in early access currently and Eisenhauer says there’s more on the way. Along with those ideas, Eisenhauer also hopes to implement a means for users to upload their own sheet music and a virtual metronome help to keep a rhythm. Travel and learning instruments can be elusive endeavors for many reasons, but they can be supplemented with digital content. Virtual reality is the most immersive means to do so, which is what makes Percussive VR and applications like them so intriguing. Though lacking the accurate resistance of hitting the instrumentals, hopefully someone will be able to adapt to real life play. Percussive VR is currently available on Steam for the discounted price of $8.49.